How We Discovered This Book: This book was read at the weekly story time at our local bookstore. Elizabeth loved it so much, we bought it so Aidan could join in at home. This book introduces children to yoga. On each page, a child tries another yoga pose, with prose to guide them. The prose flows nicely, and introduces one yoga pose at a time, based on animals or a mountain. Children can follow along without really knowing they are doing yoga. The smoothness of the language and the pacing caused my children to focus so that they could follow along, which is a big accomplishment in my house. Aidan likes finding a spot on the carpet next to his sister, ready to do each of the poses. He also enjoys reading the book aloud while Elizabeth completes the poses (with some coaching from him, of course). He has now proudly added “Namaste” to his vocabulary. Interested in teaching some yoga in your classroom? Check out this site, which has some tips specific to teaching children yoga, along with some coloring pages and other information. Taeeun Yoo Etsy Shop: If you love the illustrations and would like to buy a print of the children doing yoga (or prints from her other books), check out her Etsy shop. This entry was posted in Book Reviews, Katie, Picture Books and tagged Namaste, Taeeun Yoo, Yoga. Bookmark the permalink. What a delightful sounding book! Great way to introduce kids to yoga — and I love that your little guy has added “Namaste” to his vocabulary! Are you going to link this review over on Susanna Leonard Hill’s Perfect Picture Book Friday? We have Babar’s Yoga for Elephants, which has captured by 2 year old’s attention, but is a little challenging for him to actually do. Maybe this one will be a little easier, I will check it out. I had no idea there were so many kid yoga books. Sounds like a unique and lovely book. Love the idea of this book. Wish more kids were taught yoga for relaxation and focus. Will want to check it out! Great pick! 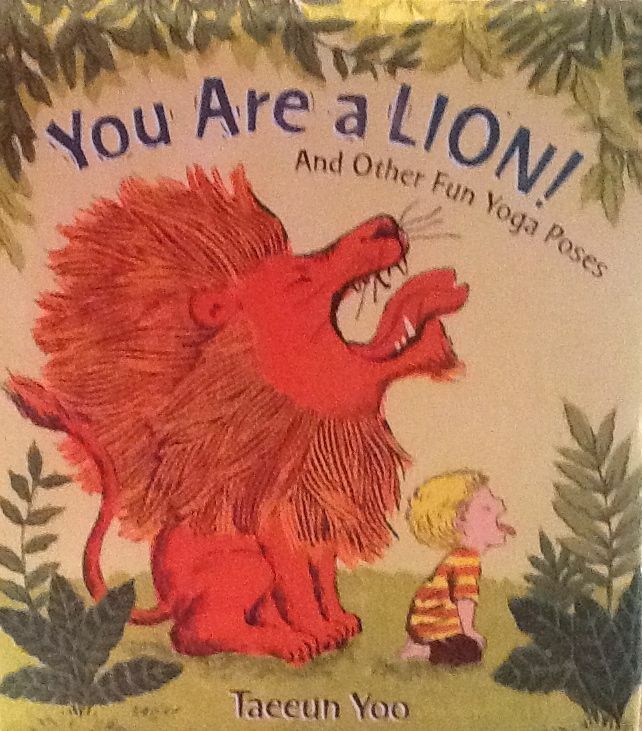 I love that it is yoga with a LION! How cute! Funny, a song came to me the minute I laid eyes on the cover of this book, now I can’t get it out of my head.. What a great way to introduce yoga to young children. Excellent choice for PPBF! What a great idea to have a book that introduces kids to yoga! The cover is just as cute as can be!